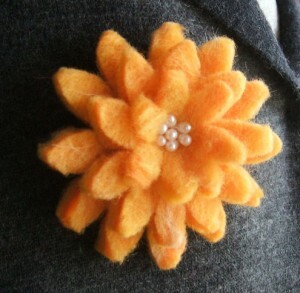 Yes, I have returned from the fog of listing corsages on Folksy which almost made my eyes bleed! To make up for this, I have this for you! If you buy two felt corsages, you get a third one free! So buy something for your mum, your partners mum, and get something for yourself for free!!!! This offer will run until midnight on 18 March, to allow for delivery in time for Mothers Day. This offer is only open to UK residents, I will be running a similar event at the end of April/start of May for other countries. This is an example of one of the seven corsages in my Folksy shop. In my Etsy shop there are 13 to choose from, and I hope to be adding some more depending on the light I can get to photograph them! So get in there and have a look and choose a few! I will try to do a proper blog post later, this one just feels like I’m just trying to sell you stuff, oh wait, I am!! Oh my! What a gorgeously scrummy colour!